This is my favorite time of year because it’s getting cooler and there’s so many tasty things to make. We carved(or “scarved” as Kaden says) our pumpkins the other night in front of the fireplace. Baked pumpkin seeds are of my of favorite snacks for this time of year. 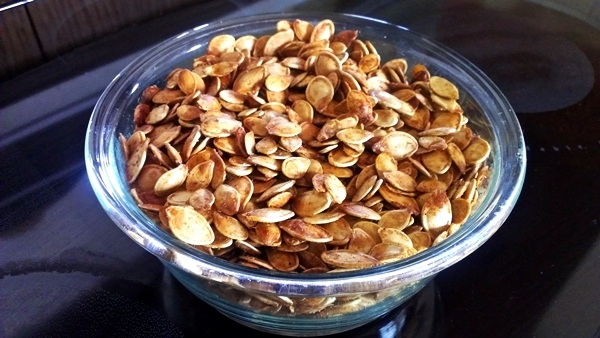 I found a really good recipe for sweet and spicy pumpkin seeds a few years ago and adapted it to make it mine and have been using that recipe ever since. They really aren’t spicy like the name says, but they are sooo good. This year we had a lot of pumpkins so I ended up having to double the recipe, but that’s fine with me. More seeds! This is the best salty, crunchy snack ever! Preheat oven to 300 degrees. Line baking sheet with foil. Stir together butter and seeds in a bowl until evenly coated. Add salt, Worcestershire sauce, brown sugar and hot sauce and mix well. Spread in a single layer on baking sheet. Bake in preheated oven for about 45 minutes, until slightly browned and crispy. Well, the weather has been cold and just right for chili making. And it’s October, so I thought we would try out some Pumpkin Chili. I was a little worried if this would actually be good or not, but it turned out really well. I usually don’t like chili that has a lot of meat or beans in it, but this was yummy. In a large pot or Dutch oven, cook beef and onion over medium heat until no longer pink; drain. Stir in the remaining ingredients. Add water or beef stock if desired to reduce thickness. ( Mine was a little think for my liking, so I added about 1 1/2 cups beef broth) Bring to a boil. Reduce heat; cover and simmer for 1 hour. I served mine with tortilla chips, shredded cheese and some hot sauce. Heat oil in a Dutch oven or large pot over medium heat. Add pork, season with salt and pepper, then cook for 10 minutes. Add onion and spices then cook until pork is no longer pink in the center, about 5 more minutes. 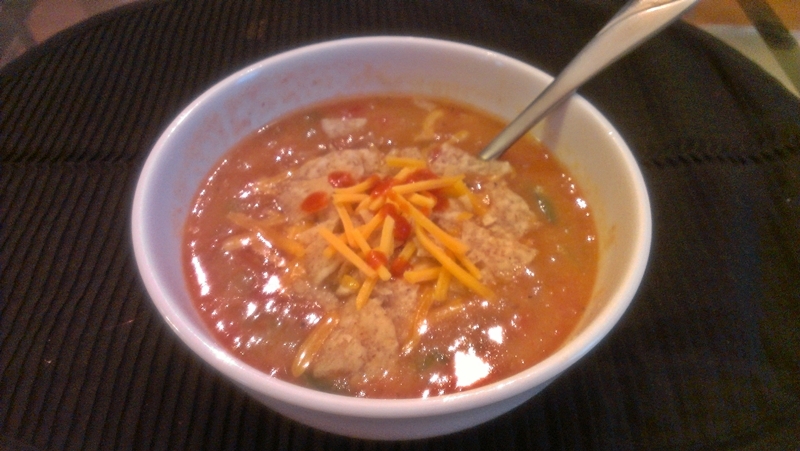 Add fresh tomatoes, canned tomatoes, green chilies, and jalapenos, then bring chili to a simmer and cook for 5 minutes. 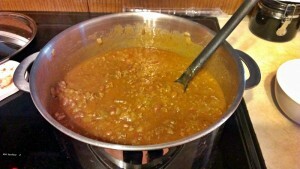 Add chicken broth, increase heat to medium-high and bring chili to a rolling boil. 2. While chili is coming up to a rolling boil, melt butter in a small saucepan over medium heat then whisk in flour and cook for 1 minute. Very slowly drizzle mixture into the boiling chili, whisking the chili vigorously the entire time. 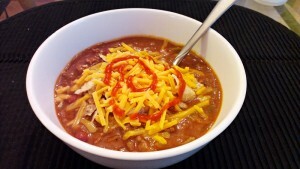 Turn off heat, give chili one last big stir, then let stand 5 minutes before serving. Top with cheese and chips. I also sprinkled on some hot sauce.